Seems like a good idea for the first 150 ft. Red Bull does not disappoint when it comes to mixing fun with a heavy dose of crazy. The infamous Soapbox Races returned to Elysian Park in Los Angeles, California on Sunday. 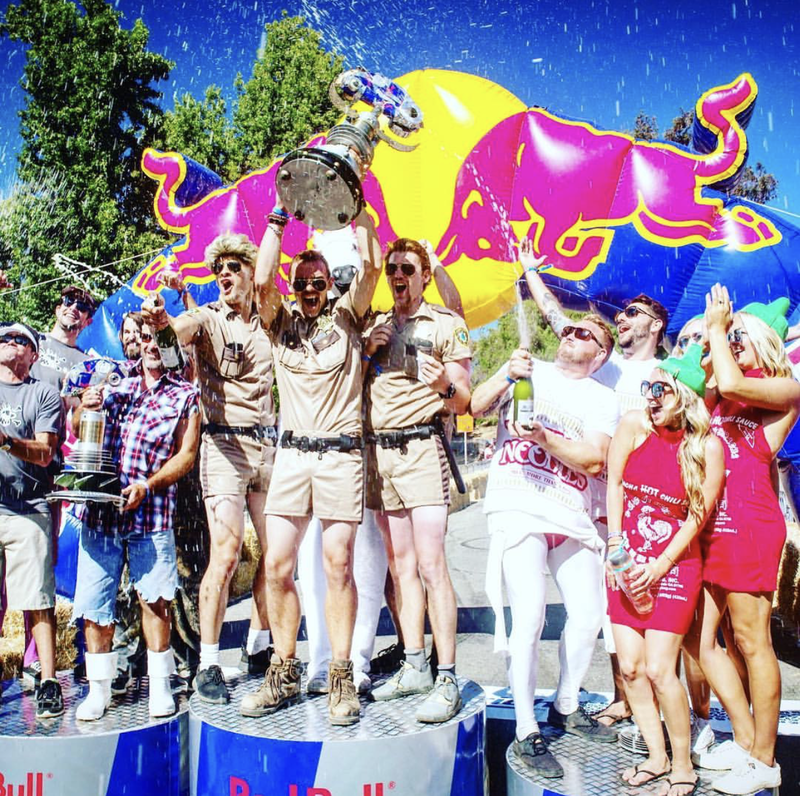 After a six-year hiatus crowds lined the streets to watch adrenaline junkies race non-motorized soapboxes through sharp chicanes, corners and jumps in hopes of even reaching the finish line. The VIP area was very colorful with the new James Haunt artist bottles. 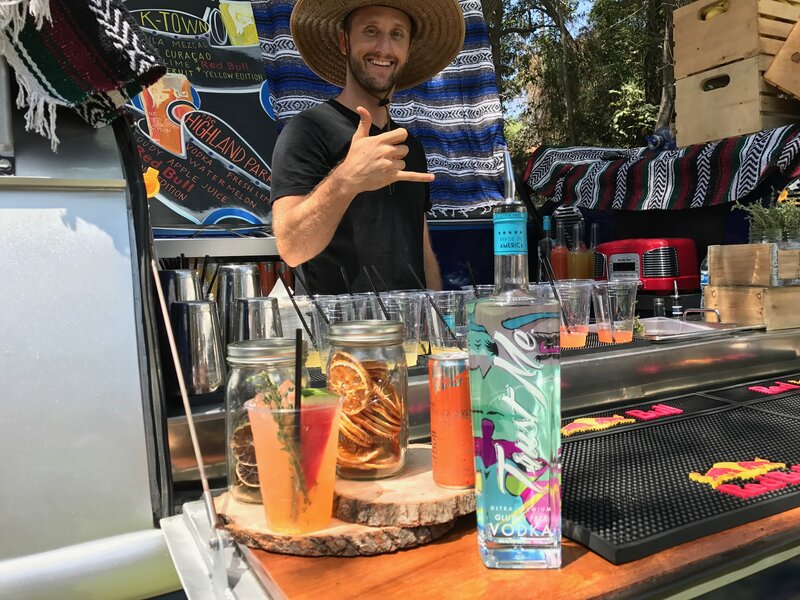 For those watching from the sidelines, Trust Me Vodka had the privilege of supplying ice cold cocktails for Sunday Funday. 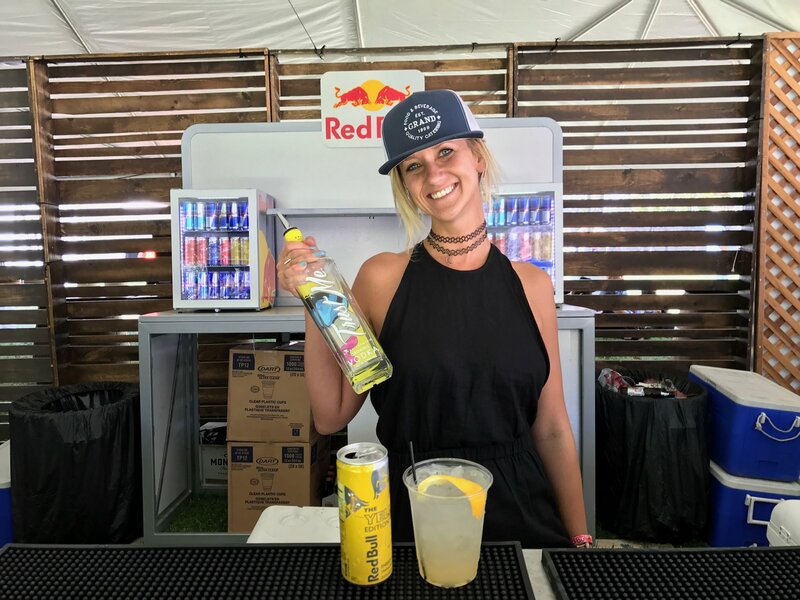 While 70 hand selected entries waited their turn to blast the downhill, our own James Haunt debuted his new bottles while doing some live painting that fit the race scene perfectly and kept the VIPs cool and happy. Trust Me Vodka and LA based artist James Haunt recently got together to brainstorm on how to introduce our newest bottle art, starting in our own backyard. Beautiful beaches, weather and women all seem to be the standard in this sunny Southern California beach town. As summer winds down we realized it’s never too late to add our own touch of beauty to a city that seems to celebrate summer year round. 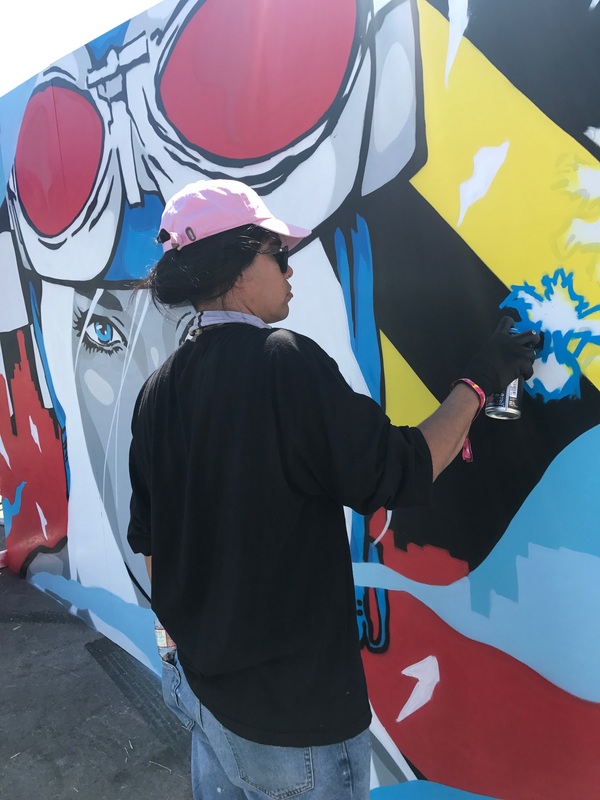 In nearly 12 hours James Haunt and a small team of friends got together to give the town a facelift on 2 of Carlsbad Village’s most visible locations. The added color and beauty is something you can’t miss and is worth the trip to see with your own eyes. We predict a social media spike for anyone that jumps in front of these for their next selfie. Enjoy a behind the scenes look at the process with our newest artist James Haunt. Booze Cruise Season is On! Here’s what NOT to do. We all know that booze on cruise ships is notoriously expensive, for mostly poor quality products. In others words, you won’t be finding any Trust Me Vodka anywhere on board. We can’t live without Trust Me Vodka for ten days, but also can’t, in good conscience, tell you how to sneak it on board. Nor would we, because nobody likes a snitch. But what we CAN tell you is how NOT to sneak booze on board, because they’re on to all you booze smugglers. We did a little research and found they are calling you out on their BLOGS, fam. So, time to get more creative. James Haunt was raised in East Los Angeles, where he became interested in art through comic books, graphic novels and pop culture. He started drawing because, as a bit of a troublemaker, he spent a lot of time in his room being grounded. As Haunt evolved as an artist, he got into the graffiti scene. After studying graphic arts in high school, he began to shift his focus to a more commercial and less dangerous outlet for his creativity. His breakthrough moment came at an Agenda (action sports) trade show. Rumor has it Haunt engaged in a little guerilla marketing by stamping crisp one dollar bills with the James Haunt smiley face logo over George Washington’s likeness. He dropped them casually as he strolled through the aisles. People picked them up, saw the logo and went looking for more until they saw the same logo on Haunt’s booth in the show. A star was born. Since then, Haunt has built his career as a working artist, kind of a unicorn among creatives. It’s rare for artists to support themselves doing exactly what they love, in its purest form. His art has allowed him to travel and meet people all from all over the world. 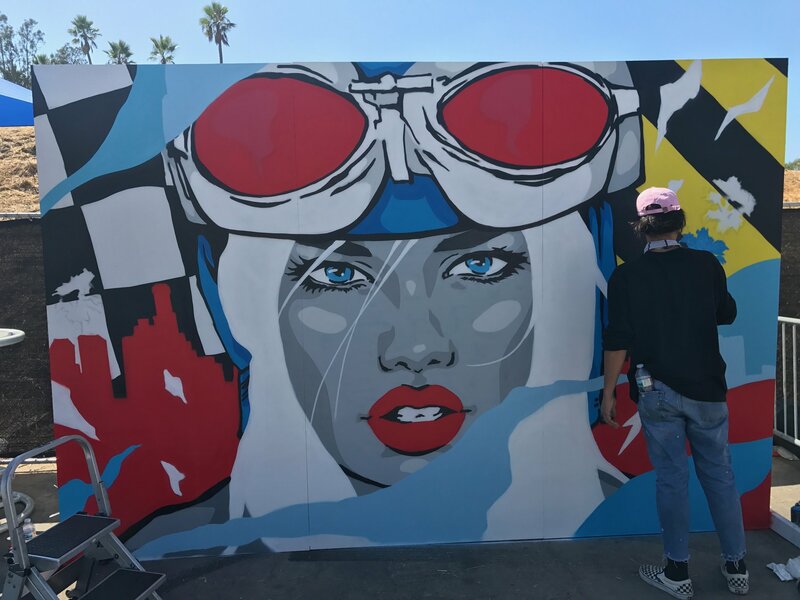 James Haunt has been commissioned to do spray painted murals for Red Bull’s offices, Big Bear Resort, Hotel Erwin, Wahoo’s and at too many locations to list in the Los Angeles and Palm Springs areas. Haunt is influenced by the California lifestyle, specifically the sun, the palm trees and that feel-good vibe endemic to beach culture. He paints what makes him happy, which for right now is a recurring theme of beautiful women. Trust Me Vodka supports artists by allowing a total takeover of our bottles, offering them a wide-ranging commercial canvas. It’s our thought that vodka may be colorless, but the bottles don’t have to be. We immediately connected with Haunt, sharing the same passion for our respective crafts. 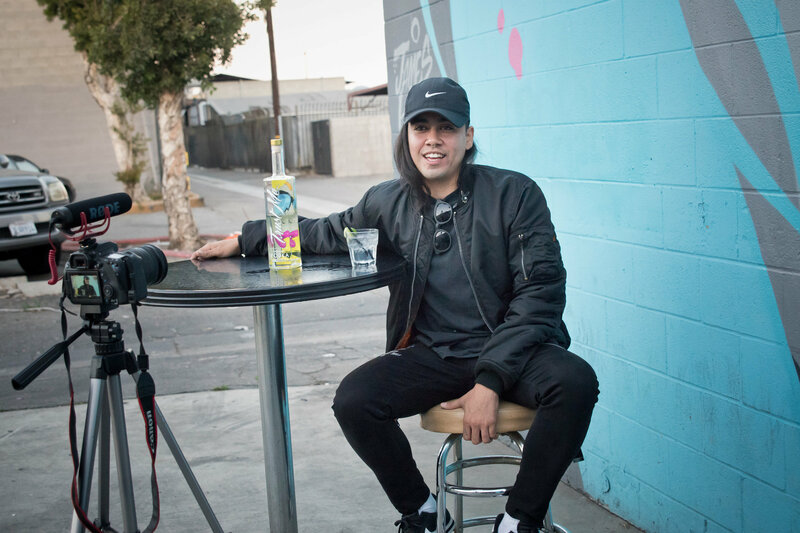 From walls to dollar bills or to buildings, Haunt is now offering his art to the world on limited edition Trust Me Organic and Gluten Free Vodka bottles. Our vodka won’t last long, but the James Haunt bottles can take a more permanent place on the shelf, in a glass cabinet or on your counter. Look for them Summer of 2017. This summer, we thought we’d try something new for our recipes. 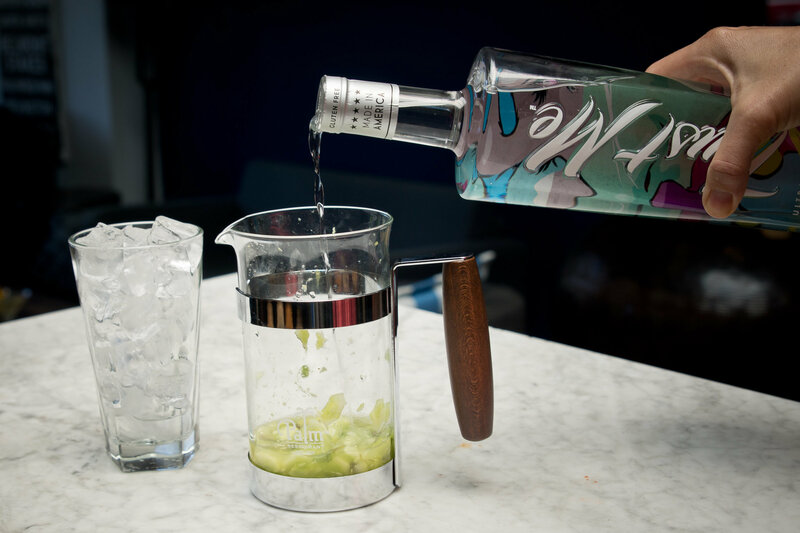 Thanks to bloggers like Nick Hines over at Vinepair and Justine Sterling at Supercall, we got the idea to infuse our vodka with local herbs, fruits and teas using a French press. Vodka infusions done without a press take 24-48 hours. With the French press, you can get great results in under 20 minutes. Head over to Chino Farms in Del Mar for specialty herbs and fruit if you feel like experimenting with some novel ingredients, which we did. Special thanks to Searsucker in Del Mar for letting us play Swedish Chef in your back bar and sorry about the mess! Add all ingredients to a French press, stir vigorously, allow to steep for 5-20 minutes, depending on how long it takes for you to wash your sticky, cayenne pepper-infused hands. Press, pour into chilled glass and garnish with fresh cantaloupe chunks and lemon balm leaves. Warning: Don’t touch your eyes for a good 20 minutes after washing your hands. Make Cucumber-ade! Add all ingredients to a French press, stir vigorously, let steep for 5-20 minutes, depending on your patience level. Press, pour into glass with ice and garnish with lemon peel and sprinkled herbs. Then drink and cheer up. Put everything into a French press, stir, let steep for 5 minutes, pour into a chilled glass and garnish with a strawberry and mint leaves. Don’t let your feet touch the floor until it’s all gone. To muddle the fruit and herbs, you can use a mortar and pestle, or just throw the fruit in a blender or food processor. Roll the herbs into a little bouquet and crush with the flat side of a knife if you don’t have a mortar and pestle and toss everything in the French press. How long you leave the vodka in the French press really changes the flavor. Play with the amount of time you let it sit and note the results. How much vodka you add also contributes. We aren’t the vodka police, so take the 1 C advice loosely. Keep in mind that if you add more vodka it will dilute the flavor, so if you want more drinks, double the whole recipe to maintain the same flavor profile. We only added a little agave or simple syrup to one drink, as the ripe fruit was sweet enough on its own.